Q: How old does my child have to be to get started? A: Our Parent-Tot (with parent participation) classes start as young as 18-months old. Pre-school classes (without parent participation) typically start at 2.5 years. Recreational classes start at 5-6 years and go up to 18 years. Keep a close eye as we will soon begin offering baby class time for parent and pre-walking infants. Q: How do I register for classes for my child? Q: How do NGTC prices compare to other gyms? A: We are proud to offer the best value in gymnastics training in the entire Portland Area. Our prices are more expensive than other gyms in the area. However, we invest a great deal of time and money into training and continuing education for all our coaches and staff. So, even though you will pay a little more at NGTC, your child will learn more and improve faster with our professional staff and enhanced class structure. Additionally, while other gyms charge per “session” for tuition, our tuition is always calculated on a monthly basis. This saves you at least one – two payments per year. Q: What is the Athlete to Teacher Ratio? Q: What if I’m not sure my son/daughter is going to like gymnastics? A: We encourage you to call, email or stop-by the office and sign-up for a free trial-class. There is never any charge for this trial, and it gives you the chance to see if your child is going to like gymnastics, the coaches, etc. before investing any money. A: For the safety of your child, and the NGTC staff, we ask that girls wear leotards with optional shorts. In order to comply with USAG SafeSport, We do not allow girls to practice in sports bras and shorts. Boys should wear tighter t-shirts and shorts or sweats. Boys are not allowed to practice without a shirt. Hair should always be pulled-back in a pony or pigtails if it is longer than shoulder length. Q: How early do I need to have my child at the gym prior to class? A: We usually recommend at least 5-minutes early so that your child can change and be ready to go when class starts. However, NGTC is not a day-care and cannot be responsible for kids left more than 10 minutes before and/or after class. If an athlete is dropped off too early or picked up too late, a $1 per minute fee will be charged. Q: How do I get my son/daughter on team? A: Team is by invitation only. Try-outs are held annually at which time the coaches have a chance to evaluate each gymnast. If you believe you and your child wish to pursue a position one of our competitive teams, we encourage you to let reception know so that we can inform you of any upcoming try-out times and answer any other questions you may have. Q: Does NGTC accept every child that applies for a recreational or team class? A: We would love to allow every child an opportunity to learn gymnastics at NGTC. Unfortunately, do to safety concerns for all our students and coaches, we reserve the right to refuse service to those students and/or families that are deemed by the staff and/or coaches, not to be a good fit for our gym for whatever reason. Q: We will be away on vacation for a couple classes. Can we do a make-up class? A: Absolutely. However, We ask that you call or email the office prior to the missed class(es), otherwise your request for a make-up class may be rejected. Please check with reception to schedule a make-up class. A: Payment is due on the 15h of each month. We encourage you to contact or stop by reception and be set-up for auto-pay. We do charge a $25 late-fee for payments received after the 1st of each month. A: Cash, Check, and all major credit cars are all accepted. NGTC is also in the process of setting up ACH drafts for our customers. Q: Are family/ friends allowed to watch? A: We encourage this! However, Our viewing area has limited seating so there may not be room for everyone. Please note, due to SafeSport Regulations, NGTC does not allow any spectators to enter the gymnastics area. We ask that you stay in the viewing area only when watching or waiting for your child. Thank you for your cooperation in this matter. Q: What is your policy should we need to drop a class? A: To help us maintain proper class sizes and ensure each class is fun and effective, we require a minimum of one-month (30 days) notice prior to your last class. This notice must be in writing on one of our NGTC Account-Hold forms, available at reception, and approved by an NGTC manager. They will assist you in pro-rating the tuition based on time remaining. All outstanding balances must be paid in full in order for the drop to take effect. Q: When do you have Open Gym (Parent’s Night Out) times? 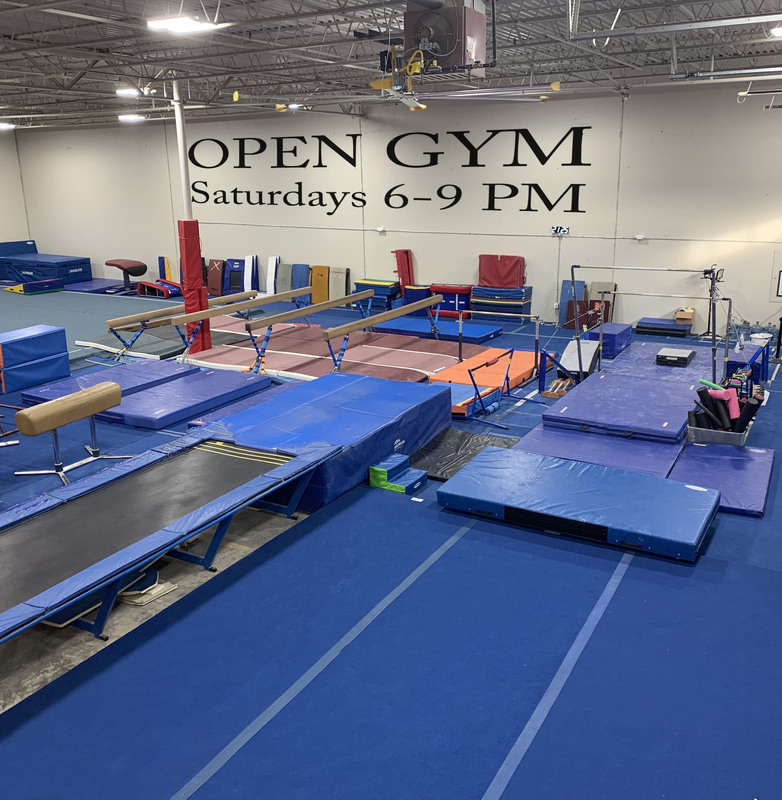 A: Open Gym, many times referred to as Parent’s Night Out, is a great way to let the kids play at the gym in a fun, safe, professionally supervised environment while the parents do whatever they wish. Currently, for children between the ages of 5 & 18 years, we offer Open Gym every Saturday, from 6:00 – 9:00 pm. Prices are $18 for drop-ins, and only $13 if you sign-up prior to Saturday. Our team members can get in for only $9. We also offer a Tuesday morning Open Gym option! Every Tuesday from 11:00AM – 12:00 PM for ages Toddler – Teen for only $5, your child gets a chance to play on all our equipment for the full-hour! Q: What is the inclement weather closure procedure? A: NGTC follows the Gresham/Barlow School District Inclement Weather Closures. If you see that Gresham/Barlow is closed due to weather, NGTC will also be closed. If you are still in question, we always post this information on our Facebook page, as an alert on our website, and on Flash Alert (available on the news and news websites under business closures). Q: Can I purchase the needed leotards,etc. at NGTC? A: Yes. We stock a large selection of leotards in every size in our Pro-Shop. Shorts, NGTC Apparel, tape, bags, water bottles and a wide variety of other items your gymnast may need are always ready for quick pick-up in the Pro-Shop. Q: How does NGTC communicate news and information about my account and happenings around the gym? A: For several years, NGTC was the only “Green” business geared entirely toward kids, in the East Portland / Gresham area. As such, we try to use electronic communication whenever possible. We send out emails to the email account(s) on record (those can be changed or new ones added in the NGTC Parent Portal) on a regular basis. We do, however give out fliers to the gymnasts when an important event is coming up. Q: Does my child have to be a member to participate? A: All athletes wanting to participate in classes at NGTC must be a member of the club. Open Gym, Birthday parties and field trips may be attended by non-members for an additional fee. Didn’t find your question here? Please don’t hesitate to call, email or stop-by anytime. We’d be happy to answer any questions you may have.